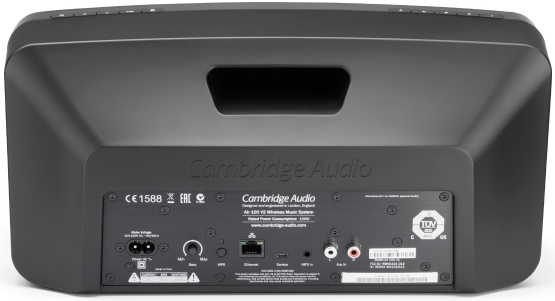 Cambridge Audio is one of the better known players in the audio industry, offering people high quality and connectivity options, at very decent prices. The Air 200 is the next in their range of speakers, which offers great power and oomph with extra features such as AirPlay, Spotify Connect and Internet Radio. AirPlay compatibility: AirPlay works with iPhone, iPad, and iPod touch with iOS 4.3.3 or later, Mac with OS X Mountain Lion, and Mac and PC with iTunes 10.2.2 or later. Quick Start Guide, safety instructions, etc. At around 1.5 feet wide and almost 9 inches across, and weighing over 5kg, this really isn’t a small speaker. While not really designed as a portable speaker, it does come with a handle slot in the top. 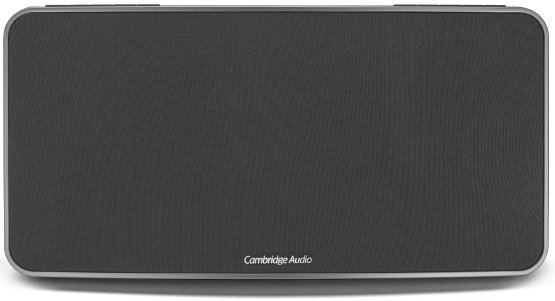 The overall looks are very standard for Cambridge Audio, giving you a decent plastic finish and fabric in front of the speakers, and controls at the back. This is a speaker that demands respect, so you will have to clear a bit of room for this. A book shelf or any table top should be just fine though, but remember, being bass heavy means you’d want to put it somewhere nice and stable. The top features a few buttons, 1-5 on the left giving you the option to access pre-set Internet Radio, while on the right you have buttons to turn it on or off, choose your input mode, or adjust volume. The front also features an LED connector in the bottom right of the front, which is hidden from view normally. This lets you know the status of the device, though it is dim enough in normal play so it shouldn’t be distracting. The back offers you controls for bass as well as WPS, and allows you to connect various ports, such as AUX in, RCA in, or even Ethernet for your internet. Rest of the back shows off various ratings and information about the device. A good solid feel means this should go anywhere, from your kitchen or dining room to your bedroom. The remote provided is pretty typical of speakers these days. Credit Card sized and tiny. Nothing to write home about. You should be connected to WiFi. We tried to do the same with just the provided ethernet cable, but it didn’t seem to work. We were being a bit fiddly though, so that might have been the problem. After that, you’re good to go from the internet point of view. However, to take full advantage of the features, you should download the Air app from your respect App store (Android or iOS). If stuck, just visit the link for the product below, which includes very helpful videos on how to set things up. Unlike internet radios that work directly from the actual device, this one comes with 10 preset channels and relies on you to chop and change or set presets via the app. This is mostly because of the reason that the device doesn’t come with any screens, and you have to rely on an external screen to set it up. Having said that, once you’re sorted, it works just fine. The Air App also allows you to configure other features, such as help with Spotify Connect and change features such as bass and Equaliser settings, or adjust power down. So, what kind of sound does this device pack? A very impressive one. A simple test I often use is to just try and listen to a bit of classical music. Today I have picked up a random playlist that specialises in almost entirely classic battle scene sound tracks, and boy, not only am I feeling the power, but the intensity of the background music is definitely powering this review as well. In terms of performance, you have extreme clarity, no distortion at all, even at high volumes, and a fairly well balanced experience. I left the bass in the middle, and it worked just fine for me. The Air 200 features Cambridge Audio’s own bespoke BMR (Balanced Mode Radiator) speakers, and they deliver rather well. While this speaker isn’t entirely tiny, the way the sound fills up the room is particularly exciting. While you can’t really take it outdoors (unless you have a long lead), this is easily the one to choose for a big hall or room. More information as well as retailer information is available via the Cambridge Audio website. The Air 200 retails for £400, and is available in white and black. Cambridge Audio have done it again. While I found the internet radio feature a bit primitive compared to some of the competition out there, and the App a bit basic, the sound quality is second to none. You have the power, the clarity, and the detail.